What is the Church of Christ? How do we understand the place of the Orthodox Church in the diverse Chrisitan world around us and our mutual relations with that world? 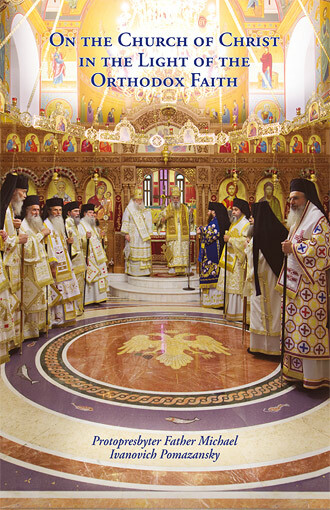 Why is it important to belong to the Orthodox Church? These questions and perplexitios are what this small book strives to answer. In our modern age, compromised by ecumenism and a relativistic spirit, focusing on such questions is of paramount importance for the preservation and defense of our Faith. Father Michael Pomazansky was born in 1888 in Russia to a family of clergymen. He graduated from the Kiev Theological Academy, in 1912, and was appointed an Instructor at the Kaluga Seminary (near Moscow) two years later. He was ordained a Priest in 1936. In 1949, he moved to America, where he taught at the Holy Trinity Seminary, in Jordanville, NY. One of the more erudite theologians of the twentieth century, he was an indefatigable defender of traditional Orthodox teachings and a candid critic of the religious syncretism fostered by the ecumenical movement. At the same time, he was an erudite, brilliant defender of the Patristic principle of the “Royal Path” of moderation, which is everywhere evident in his writings. Seraphim Englehardt is a graduate of Siena College and Holy Trinity Orthodox Seminary, where he was a student of Father Pomazansky. He holds a Master’s degree from Norwich University Russian School and a second Master’s degree from Georgetown University. A voting member of the American Translator’s Association, he is the translator or editor of numerous Russian articles and books published by Holy Trinity Seminary and St. John of Kronstadt Press. When you have chosen all of the items that you wish to purchase, click here to go to the order form. © 2014 C.T.O.S. All rights reserved.